Patra's Other Place: Day two of roof works. The men turned up at 7.30 am today - just as well they know the way into the back yard now, as we had slept in, and I would have been mortified if I'd had to go outside in my dressing gown, no teeth and wild uncombed hair, to open the gate! Last night's red sky was true to form and it was a perfect sunny day all day, and a bit warmer than yesterday, so the guys got a lot done. I didn't bother taking photos because from the back yard you wouldn't be able to tell the difference from the pics I posted here yesterday. They got most of the roofing done except for the very back of the house which is our bedroom and the laundry. We can feel the difference already tonight - the house doesn't have that chill inside that it always had before on cold nights, despite heaters being on. So the new insulation is living up to its reputation of keeping out the cold. 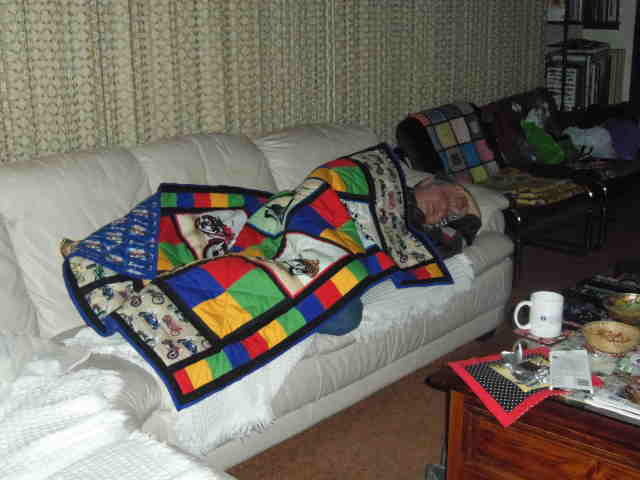 But Ken always feels cold at night due to his poor health, so tonight he christened the quilted throw that I made him (I finished the final lot of hand stitching today). He's been under there for about two hours now! Shiftclick if you are reading this, in answer to your comment, yes the possum is friendly. I put apple out on the front porch for it every night and she will take pieces from my hand without being scared. I've even patted her sometimes, they are so soft! I know it is a 'she' because when she has a baby in her pouch she comes to show us - really cute! And she was back in her usual spot again today despite the workers thundering around on the roof right over her head! Oh, how lovely, your quilt. Just so you know, between a local quilting friend and your creativity, I have been inspired and have purchased a SewEzi table, to be here next Wednesday. My sewing machine (new!) has been idle too long. That looks like a lovely quilt. How clever you are.